Apple’s iPad has a stunningly attractive aluminum case, and the slang word “slick” seems tailor-made for the device. But the iPad is very slick to hold in addition to being slick to look at. If you carry it around in a briefcase or backpack, you also need to protect that glorious screen from all the rest of the things you carry around. A great many rubbery, silicon cases are available to make the iPad easier to hold and more shock resistant, but a rubbery case does nothing to protect the screen. This iPad cover was purchased in desperation for my spouse's Apple iPad. The CrazyOnDigital iPad folio cover protects your iPad and looks very professional, too. So, following the worldwide shortage of iPad peripherals after the iPad's introduction, I went looking for a folio cover, something that wrapped around the entire iPad to protect the device from briefcase detritus and coworker clumsiness. I’d purchased an iPad for my spouse, and after one day at work, she decided it needed protection. Apple stores were sold out of their own folio cover, the Apple iPad Case. Best Buy and other Apple resellers were stocked to the gills with colorful rubbery cases, but nothing that covered the screen. Time to bring out the big gun: Amazon. 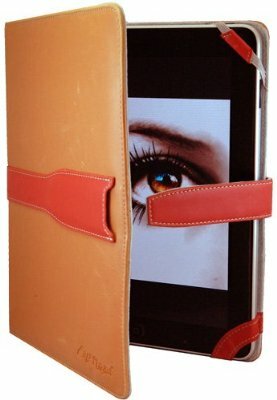 The “CrazyOnDigital Executive Leather Folio Case Cover for iPad” was purchased in desperation, based on description rather than the ridiculous name. On the good side, it was much less expensive than most covers. Even better, Amazon said was available. But was it any good? It turns out to be excellent. The color scheme, with the red strap and tan cover, looks rather casual in photos, but quite professional in reality. Because this is a folio and not a slipcase, it offers continuous protection: you never remove it from the cover, and you never have to carry around a separate piece, as you do with the many iPad slipcases available everywhere. Elastic bands hold all four corners of the iPad snuggly inside the folio at all times. One quibble: the upper right band covers the volume controls for the iPad. While this doesn't really hurt anything, it does make on-the-fly adjustments of volume a bit more cumbersome. I get the feeling that the manufacturer didn't have a real iPad on hand, just Apple's dimensions, when the case was designed. Apple’s iPad Case can be folded to make it into a stand; you can’t do that with the CrazyOnDigital folio cover. On the other hand, the CrazyOnDigital cover is nicely padded; the Apple case seems flimsy by comparison, and Apple’s case is twice the price (assuming you can find one). The folio comes with a silicon gel wristband that says "CrazyOnDigital." This might be a cool thing for a teenage girl as of a few years ago, but it is fairly useless in 2010. I’ve toyed with the idea of shooting it like a rubber band, but my spouse has responded by pointing out she has a pistol sharpshooter ribbon from the U.S. Navy. We are at an impasse.